Understanding how assemblages of invertebrates change over continuous elevational gradients not only generates an understanding of current rules of community assembly but may also be useful for predicting the future distributions of species under global change. Temperature decreases predictably with increasing elevation and, accordingly, gradients in elevation permit the study of adjacent climates within small geographical areas. The present study examines if and how assemblages of moths change with increasing elevation in the eastern French Pyrenees. Elevation had a strong effect on the assemblage composition of moth species in both seasons. The species sets which contributed most to this strong pattern differed completely across seasons. Analysis of restrictions and fidelity to particular elevational ranges generated a set of indicator species which can be used to monitor future changes in distribution. Twelve species were identified as elevation-specific indicators (the ‘predictor set’) from the spring samples and summer samples. We note the strong contrasts between species that produce overall statistical pattern and those that show strong fidelity to particular elevations and discuss this in terms of the biologies of the species concerned. We discuss best practice for the identification and use of indicator species for monitoring future responses to climate change. Handling Editor: Nigel E. Stork. We thank the Research and Exploration Committee of the National Geographic Society for providing financial support for this project (Grant 9724-15). EJD was funded by the Griffith University School of Environment and Environmental Futures Research Institute. CT was supported by the ‘Laboratoire d’Excellence’ TULIP (ANR-10-LABX-41; ANR-11-IDEX-0002-02). 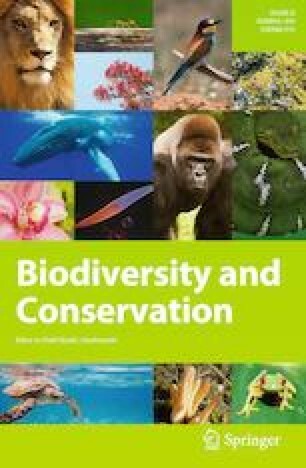 LAA was supported by the UK NERC-funded Biodiversity And Land-use Impacts on Tropical Ecosystem Function (BALI) consortium (http://bali.hmtf.info) (NERC Grant No. NE/L000016/1). We thank also Drs Beverley Kitching and John Shillcock for their invaluable help as volunteers in the field. Thank you to the reviewers for making improvements this manuscript.